Come join Merle Deneke for a quilting club! Each month, the club meets here at The Golden Needle for quilting fun! This project takes eleven (11) months. There are three sessions to choose from. You must sign up for this class at the beginning of the project. The new year's quilt for 2018 - 2019 is "Tranquility" using Timeless Treasures Batiks and Wing and a Prayer Pattern as seen in the new photo. 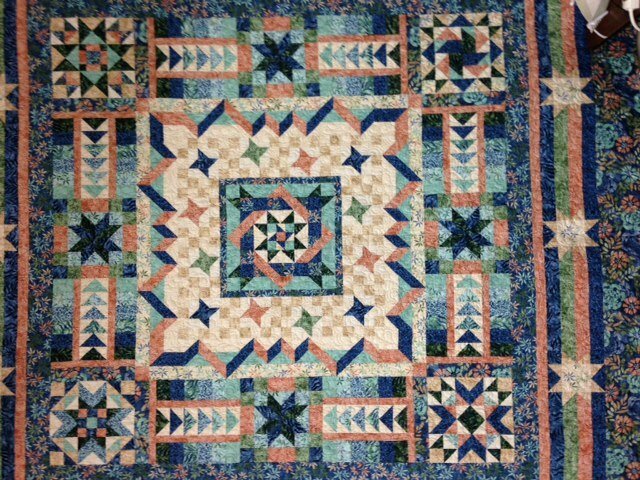 The quilt kit is retailed at $249.95 but has a reduced price of $199.00. The class fee for the entire program is $80 and covers 11 months. This quilt begins June 26 and continues the 4th Tuesday of each month. Come prepared to sew to the first class! $224 kit (includes book), $66 instructor fee. Kit does includes binding, but not the backing.